At the beginning of 1994 Matthias was commissioned by the HIV/AIDS charity CRUSAID to produce the short film Homage to Fonteyn & Nureyev as part of the Nureyev Gala Tribute at the London Coliseum – an event that brought together for one night only the world’s most distinguished ballet dancers to celebrate the great Russian dancer’s life. The 35mm film is a unique musical collage focusing on the finest pas de deux of Rudolph Nureyev and Margot Fonteyn. Matthias collaborated on the production with the Computer Film Company before it merged with Framestore. Cutting edge Wolf technology was used to digitally scan the many different film and video formats of the original footage of Nureyev and Fonteyn’s classic and moments together. 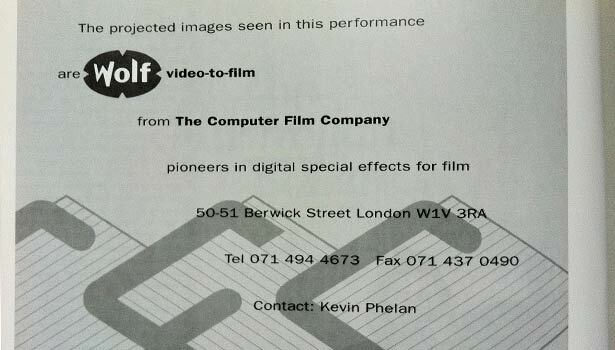 The digital files were then painstakingly converted to 35mm colour negative from which the Show Print was struck. Homage to Fonteyn & Nureyev was projected onto a specially constructed 40ft screen on 13 March in the presence of HRH The Princess Margaret, Countess of Snowdon. The silent film was accompanied on piano by Royal Opera House principle pianist Philip Gammon, narrated live on stage by Alan Bates and Vanessa Redgrave, arranged by Derek Granger, co-produced and edited by Peter Coulson, and directed by Derek Deane. “The film poignantly captured the magic of Nureyev and Fonteyn” (Sunday Times); “The one heart-stopping moment of the evening” (Financial Times); “Amazing!” (The Times).